The first control neutral insect repellent of the world: Dr. Reckhaus®, our new range of insect control with compensation areas, awarded as the world's first brand with the quality label INSECT RESPECT®. This will ensure that an insect-friendly designed compensation area is created for the insects combated by a product. 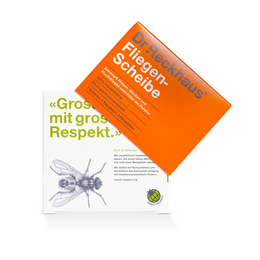 All Dr. Reckhaus products are branded with the Insect Respect Label. That is to say: A compensation for the insect loss that is caused by it's application is created previously to the buying, in the form of insect paradises (see compensation model). Dr. Reckhaus products are standing for insect repellent in the interior with highest ecological demands: reducing or avoiding the use of biocide, and then only with compensation. The quality label INSECT RESPECT® offers one solution in which the consequences of use of biocidal products are compensated. The Dr. Reckhaus Fly Trap beared the label as the world's first product, and thus compensates the insect loss as a result of use by the consumers in advance. - all materials are purchased in Germany and Switzerland, the products are manufactured in Bielefeld. The combination of effectiveness and insect repellent can also be found in the slogan "Great effect with great respect". Each product shows the actual compensation area of the individual product based on a photo and provides information about the value of insects. On the website www.insect-respect.org consumers will find among others an animated film of the value of insects, free services for insects determination and more than 100 insect fact sheets for more information. Conventional biocide products solve infestation problems only on the surface. They control individual animals without tackeling the cause of their occurrence. In ordner to liberate from vermins in the long term and to use less control products, it is necessary to engage in an early monitoring of an infestation and the removal of its causes. The Dr. Reckhaus Indian Meal Moths Monitor reliably shows moth infestation and informs you with the provided book in detail about measures for insect control as well as prevention. The Dr. Reckhaus Indian Meal Moths Monitor attracts the moths with pheromone and retains them. The product is 100% insecticide free and operates 6 months (6 weeks per trap). With natural vinegar, the Dr. Reckhaus Fruit Fly Trap Set attracts fruit flies and retains them. The provided wicks guarantee a continuing and constant trap effect. The product is active at least for 3 months (6-8 weeks per wick). The provided book contains information about fruit flies, their control as well as prevention. 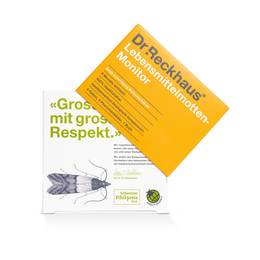 The Dr. Reckhaus Cloth Moths Monitor reliably shows moth infestation and informs you with the provided book in detail about measures for insect control as well as prevention. The Dr. Reckhaus Clothes Moths Monitor attracts the moths with pheromone and retains them. The product is 100% insecticide free and operates 6 months (3 months per trap). The Dr. Reckhaus fly trap consists of a disc, a vacuum cup for mounting on windows and films for catching the insects. It fights flies, mosquitoes and fruit flies on the window, discretely by the cover disc. Due to its adhesive effect, the product is 100 % free of insecticide. The provided book contains information about fruit flies, their control as well as prevention. 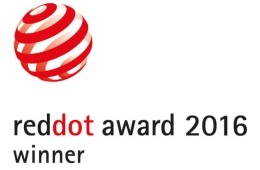 With the innovative packaging of the Dr. Reckhaus Flying Disk, the company Reckhaus won the coveted Red Dot Award: Communication Design 2016. The world-renowned competition showcases excellent communication design. In several days of meetings, the 26 experts of the Red Dot jury rated each of the numerous submissions live and on site. Designers and companies from 46 nations took part in this year's Award. 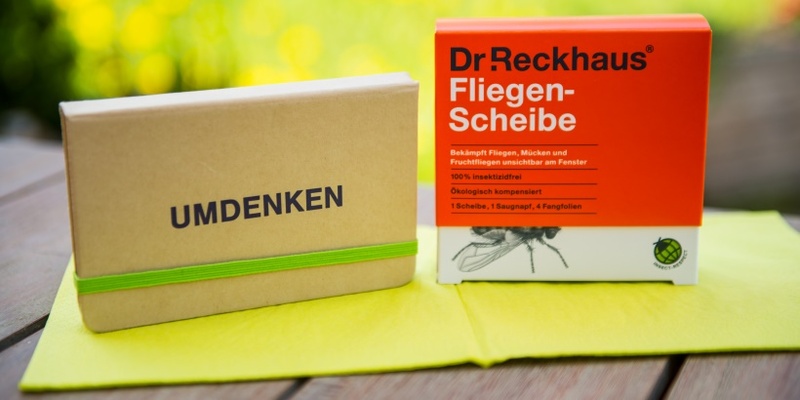 The Dr. Reckhaus Flying Disk is an insect repellent in the interior with highest ecological demands: reducing or eliminating biocide use, and if so, only with compensation, guaranteed by the quality mark INSECT RESPECT®. The award-winning packaging design highlights the value of insects, shows a picture of the compensation area for the product and leads consumers via QR-Code to a webcam picture of the insect-friendly greened roof. More information in the media release (in German). - Comprehensive efforts, in addition to neutral product use to allow neutral production. The production is carried out with 100% green electricity. All the Dr. Reckhaus products carry the label INSECT RESPECT®, making them control neutral biocide. For the product brand «Dr. Reckhaus®», the company Reckhaus operates the world's first insect compensation areas in Bielefeld (D) and Gais (CH). On 10th may 2016, the world's first control neutral biocides have been delivered. Entrepreneur Dr. Hans-Dietrich Reckhaus handed the products with the "Insect Respect" quality mark over to the FairMarkt, an organic market in Dippoldiswalde near Dresden (Germany). 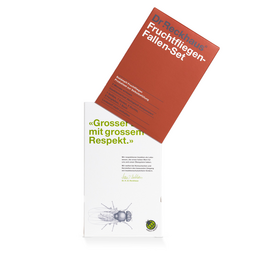 In the course of a book presentation and a short movie screening, the laureate of the German Lateral Thinker Award and of the Swiss Ethics Award stressed the enormous value of insects for our society and our economy. On 19th may 2016, Reckhaus also introduced the products into the swiss market. As of now, the store "Natur-Drogerie Stocker" in Altdorf (Uri) sells the innovation.